A protocol for organic reaction screening using stop-flow micro-tubing (SFMT) reactors employing gaseous reactants and/or visible-light mediated reactions is presented. Toh, R. W., Li, J. S., Wu, J. Utilization of Stop-flow Micro-tubing Reactors for the Development of Organic Transformations. J. Vis. Exp. (131), e56897, doi:10.3791/56897 (2018). A new reaction screening technology for organic synthesis was recently demonstrated by combining elements from both continuous micro-flow and conventional batch reactors, coined stop-flow micro-tubing (SFMT) reactors. In SFMT, chemical reactions that require high pressure can be screened in parallel through a safer and convenient way. Cross-contamination, which is a common problem in reaction screening for continuous flow reactors, is avoided in SFMT. Moreover, the commercially available light-permeable micro-tubing can be incorporated into SFMT, serving as an excellent choice for light-mediated reactions due to a more effective uniform light exposure, compared to batch reactors. Overall, the SFMT reactor system is similar to continuous flow reactors and more superior than batch reactors for reactions that incorporate gas reagents and/or require light-illumination, which enables a simple but highly efficient reaction screening system. Furthermore, any successfully developed reaction in the SFMT reactor system can be conveniently translated to continuous-flow synthesis for large scale production. Flow chemistry is well poised towards the movement of green and sustainable processes1,2. In contrast to batch reactors, continuous flow reactors possess significant advantages, such as improved thermal management, enhanced mixing control, and internal pressure regulation. These advantages greatly reduce the formation of by-products in the continuous flow system. Furthermore, continuous-flow enhances the biphasic gas-liquid reactions within the micro-tubing due to the excellent interfacial surface area of the reagents in different states. Continuous flow reactors also provide a good platform for photosynthesis due to the enhanced and uniform light illumination across the micro-tubing3. Despite success in continuous-flow technology, there are still limitations in reaction screening for parameters that involve catalysts, solvents and reagents2. Changes made to the pressure in the flow system will drastically affect the flow equilibrium. Moreover, a classic continuous flow system generally is limited to one reaction screening at a time, making it time consuming for efficient parallel reaction screening. The reaction time in continuous flow synthesis is also limited by its micro-tubing reactor size. Furthermore, continuous flow screening is prone to cross-contamination at higher temperature, even though carrier medium is employed between different reactions4. Hence, to address the difficulty of screening discrete parameters in continuous-flow systems, we developed a stop-flow micro-tubing (SFMT) reactor system for reaction screening that involves gaseous reagents and/or photo-mediated reactions2. SFMT reactors comprise elements of both batch reactors and continuous flow reactors. The introduction of shut-off valves entraps the reagents within the micro-tubing, a concept that is similar to a batch reactor, and when the system is pressurized, the SFMT behaves as a miniature high-pressure reactor. The SFMT can then be submerged into a water or oil bath, introducing heat to the reactor system. Visible lights can also be shone on the micro-tubing during the reaction period to facilitate photo-mediated reactions. In SFMT, flammable or toxic gases, such as ethylene, acetylene, and carbon monoxide, can be utilized to generate valuable chemicals in a safer way compared to batch reactors1,2,4. It is an asset to use such reactive gases as they are inexpensive chemical feedstocks and can be readily removed after reactions are completed, providing a cleaner procedure2. On the contrary, most reaction development carried out in batch reactors tends to exclude the use of reactive gases due to its inconvenience and risk of explosion at elevated pressure and temperature. If gaseous reagents are employed, they are usually introduced into batch reactors via bubbling or balloons. This generally gave lower reproducibility or reactivity due to the low mixing efficiency at the interface. Although high-pressure vessels are commonly applied to enhance reactivity and solubility of gases, they are laborious with a risk of explosion, especially with flammable gases. In addition, the opaque surface of those commonly used high-pressure reactors made it unsuitable for photo-mediated reactions. Hence, reactions that consist of gaseous reagents and photo-mediated reactions are generally left unexplored. In this context, SFMT reactors provide an ideal platform because the gaseous reagents can be utilized within the micro-tubing with the assistance of a back pressure regulator (BPR) to regulate the internal pressure in a safe and convenient manner2. Apart from reactions that involve gaseous reagents, visible-light promoted synthesis also displays great promises for organic synthesis5,6. However, one of the greatest downfall of visible-light mediated reactions is the scalability in conventional batch reactors due to the attenuation effect of photon transport in large vessels7. If high-power light sources are used, over-irradiation may result in by-product formation. Moreover, gaseous reagents have seldom been applied in photo-chemical reactions mainly due to the complex apparatus system when using gas-phase reactants at high pressure2. Through the introduction of a narrow channel, like SFMT, a high-pressure gas environment can be easily achieved under light irradiation. Hence, this detailed video aims to help more scientists understand the advantages and the procedure of using SFMT for condition screening of gas-involved transformations and light-mediated reactions. Refer to all relevant material safety data sheets (MSDS) before handling any possible toxic and carcinogenic chemicals. Conduct appropriate risk assessments before starting any reactions, including the use of engineering controls, such as fume hoods and gas cylinders, as well as wearing sufficient personal protective equipment. Proper training should be conducted before using any highly flammable gas to avoid any accidents caused by mishandling of the gas cylinders. Set gas regulator of acetylene tank to 20 psi (137895 Pa), above the desired back-pressure of 5 psi (34474 Pa) used in the system. Note: Refer to Figure 1 on more details of the gas regulator set up. Note: Back-pressure regulator (BPR) is set at the end of the tubing, refer to Figure 2 and 3 for more details on the SFMT set-up. Add a 10 mm magnetic stir bar into a 10 mL round-bottom flask. Measure 58.5 mg 4-iodoanisole with a weighing balance and transfer to the round-bottom flask. Caution: Aryl halides are irritants and can be harmful. Consult the relevant MSDSs before proceeding. Add 8.5 mg Pd(PPh3)2Cl2, 1.0mg copper(I) iodide, 21.0 mg 1, 3, 5-trimethoxybenzene (internal standard) and 80 µL N,N-Diisopropylethylamine (DIPEA) into the same round-bottom flask. Add approximately 2.5 mL of dimethyl sulfoxide (DMSO) to the round-bottom flask. Caution: Pd(PPh3)2Cl2, copper(I) iodide, DIPEA are irritants and can be harmful. Consult the relevant MSDSs before proceeding. Caution: 1, 3, 5-trimethoxybenzene are flammable and volatile. Keep away from ignition sources. Caution: DMSO is a toxic chemical. Consult the relevant MSDSs before proceeding. Seal the round bottom flask with a rubber septum and mixture was stir on a heat plate at room temperature and pressure until all the solid have dissolved. Note: Further sonication can be done to ensure a homogenous solution. Degas the reaction mixture with argon-filled balloon for approximately 15 min while maintaining a constant stirring on heat plate. Remove both needles after 15 min to ensure an inert environment within the round-bottom flask. Note: Refer to Figure 4 for details on degas procedure. Extract all the reaction mixture from the round bottom flask with a 8 mL stainless steel syringe connected to a long needle via a needle connector through the rubber septum. Remove the needle and attach the stainless steel syringe to the syringe pump. Connect the syringe to High purity Perfluoroalkoxy alkanes (HPFA) tubing (O.D. 1/16", I.D. 0.03", 300 cm, volume = 1.37 mL) via a T-connector. Note: Use a needle connector to connect both the stainless steel and long needle, refer to Figure 5 for more details on using the needle connector. Note: All air bubbles should be remove from the stainless steel syringe before attaching to the syringe pump. Note: Ensure that all the tubing are tighten before connecting the reaction mixture to the set-up to reduce exposure of air, refer to Figure 2 and 3 on the connections for the tubing. Set flow rate of the syringe pump to 300 µL/min for the reaction mixture to be pumped into the HPFA tubing. Adjust the flow rate of acetylene with the needle valve to about 1:1 liquid:gas ratio along the plugs. Equilibrated ratio was maintained until the HPFA tubing is filled with gas/liquid slug reagents. Caution: Acetylene is highly flammable. Keep away from ignition sources. Note: BPR is placed in acetone vial before purging the tubing with acetylene gas. Note: Purge the tubing with acetylene gas first until bubble is observed in the acetone vial for the BPR to ensure that the pressure is built up within the SFMT reactor before pumping the reaction mixture into the SFMT reactor. Refer to Figure 6 for better illustration of the liquid:gas ratio. Close the valve at the end when all the liquid had been injected into the HPFA tubing or when liquid start to leak from the BPR. Pump in more acetylene until the liquid stops moving in the tubing in order to maintain the pressure within the tubing. Close the valve at the start point and close the needle valve once complete. Transfer the whole set-up into the oil bath and incubate for 2 hours. Note: The valves are kept above the oil bath to prevent contamination from the silicon oil. Note: Pre-heat the oil bath to the desired temperature before transferring the SFMT reactor to it. After 1 hour, pump the reaction mixture into a 10 mL vial using a 8 mL stainless steel syringe. Fill an 8 mL stainless steel syringe with diethyl ether (approximately 4.0 mL) to wash out any residue in the tubing. Caution: Diethyl ether is highly flammable. Keep away from all ignition sources. Note: Hexane could be used to wash away the silicon oil before proceeding to avoid contamination for subsequent steps. Saturated NH4Cl aqueous solution (4.0 mL) was added to the combined organic layer, followed by a liquid-liquid extraction with 1.5 mL diethyl ether, with the aid of a separatory funnel. Caution: NH4Cl may be harmful. Consult the relevant MSDSs before proceeding. Conduct a gas chromatography mass spectrum (GC-MS) analysis with the organic layer to determine the yield. Note: 1, 3, 5-trimethoxybenzene was added in step 1.2.3 as an internal standard. Note: An internal standard calibration curve was plot with different mass of the product to derive a linear regression curve. The yield of the product is interpolated from the linear regression curve. Refer to Ref. 2 for more details on the calibration curve. Add 30.8 mg benzylidenemalonitrile, 4.1 mg 9-mesityl-10-methylacridinium perchlorate, 67.3 mg tetramethylethylene and 2.0 mL dichloroethane into a 10 mL silicon septa vial. Caution: Benzylidenemalonitrile, 9-mesityl-10-methylacridinium perchlorate, tetramethylethylene and dichloroethane are highly flammable. Keep away from all ignition sources. Degas for about 15 minutes with argon-filled balloon. Remove both needles after 15 min to ensure an inert environment within the vial. Purge the HPFA tubing (O.D. 1/16", I.D. 0.03", 340 cm, volume = 1.5 mL) with argon gas for approximately 5 min by direct connection of the SFMT reactor to the argon gas cylinder with an Union body PEEK. Close both valves to entrap the argon gas within the HPFA tubing after reaching the indicating time of 5 min. Note: Refer to Figure 5 for more details on using the Union body PEEK. With a 3 mL disposable syringe attached with a long needle, extract the reaction mixture from 10 mL silicon septa vial. Remove the needle and connect the disposable syringe to the HPFA tubing via a syringe connector. Open both valves to pump in the reaction mixture manually. Close both valves again once the HPFA tubing has been filled with the reaction mixture. Note: Refer to Figure 5 for more details on using the syringe connector. Note: Mix the reaction mixture well with the syringe to ensure a homogenous solution before pumping into the HPFA tubing. Note: There may be excess solvent that will exceed the tubing volume. Place the tubing end on a waste can to collect any overflowed reaction mixture. Place the SFMT reactor in the middle of the blue LED (λmax = 425 nm, 2 m, 20 W) stripe to ensure equal exposure of the HPFA tubing. The HPFA was exposed for irradiation for approximately 5-48 hours. Note: The length of the blue LED stripe is set to 2 meters to provide enough energy for the reaction to proceed. Pump out the reaction mixture with 3 mL disposable syringe into a clean round-bottom flask with a syringe connector piece. Wash out any residue with excess diethyl ether using a 3 mL disposable syringe into the same round-bottom flask. Measure 0.06 mmol of 1, 3, 5-trimethoxybenzene (internal standard) and add to combined organic mixture. Remove excess solvent under reduced pressure with a rotavap machine. Measure 0.6 mL of deuterated chloroform with 1 mL disposable syringe attached with long needle and add to the concentrated crude product. Transfer the deuterated mixture into a clean NMR tube for crude 1H NMR analysis. Note: The integral (x) for internal standard at 6.10 ppm is used to calculate the conversion rate by comparing the integral (y) of product formed at 3.38 ppm. Set the gas regulator of the acetylene tank to about 20 psi (137895 Pa) which is above the desired back-pressure of 5 psi (34474 Pa) in the system. Under inert atmosphere, add 74.1 mg bromopentafluorobenzene , 2.8 mg Ir(ppy)2(dtbbpy)PF6 and 46.8 mg 2,2,6,6-Tetramethylpiperidin-1-yl)oxyl (TEMPO) into a 10 mL silicon septa. Add 3.0 mL of acetonitrile into the same 10 mL glass vial to dissolve all the reagents. Caution: Bromopentafluorobenzene and acetonitrile are highly flammable and volatile. Keep away from all ignition sources. Caution: Ir(ppy)2(dtbbpy)PF6 and TEMPO may be harmful. Consult the relevant MSDSs before proceeding. Degas the reaction mixture with argon-filled balloon carefully for 10 minutes in an ice bath. Remove both needles from the septa to ensure an inert atmosphere in the vial. Add 56.0 µL of DIPEA into the mixture with a 1 mL syringe and degas for another 5 minutes in an ice bath similar to step 3.2.2. With a 8 mL stainless steel syringe attached with long needle via a needle connector, extract the reaction mixture from the silicon septa vial. Remove the needle and attach the syringe to the syringe pump. Connect the outlet to T-connector. Note: All gas should be remove from the stainless steel syringe before attaching to the syringe pump. Note: Ensure that all the tubing are tighten before connecting the reaction mixture to the set-up to reduce exposure of gas, refer to Figure 2 and 3 on the connections for the tubing. Set the flow apparatus' flow rate to 100 µL/min and pump the reaction mixture into the HPFA tubing (O.D. 1/16", I.D. 0.03", 300 cm, volume = 1.37 mL). Adjust the flow rate of acetylene with the needle valve until 2:1 gas/liquid ratio is observed in the plug. The ratio plugs was determine via estimation in the clear tubing. Note: Purge the tubing with acetylene gas first until bubble is observed in the acetone vial for the BPR to ensure that the pressure is built up within the SFMT reactor before pumping reaction mixture into the SFMT reactor. Note: Refer to Figure 6 for better illustration of the liquid:gas ratio but take note that the volume of the gas should be double the volume of the liquid in the plug by visual estimation. Close the valve at the end when all the liquid had been injected into the SFMT reactor (total volume 0.65 ml, 0.065 mmol) or when liquid started to leak from the BPR. Pump in more acetylene until the liquid stop moving in the tubing. Close the valve at the start point and close the needle valve once done. Transfer the whole set-up to a water bath pre-heated to 60°C, and allowed to react for 3 h under blue LED light (λmax = 425 nm, 3 m, 30 W). Note: The valves are left above the water bath to prevent any contamination. Note: The length of the blue LED stripe is set to 3 meters to provide enough energy for the reaction to proceed. Pump the reaction mixture from the HPFA tubing with a 8 mL stainless syringe into a round-bottom flask. Wash out the residues from the tubing reactor with excess diethyl ether into the same round-bottom flask. Concentrate the mixture under reduced pressure with a rotavap machine. Note: Carefully reduce the pressure as the starting material and products are highly volatile. Add 0.6 mL of deuterated chloroform via a 1 mL disposable syringe into the round-bottom flask to dissolve the concentrated crude mixture. Transfer the deuterated mixture into an NMR tubing for 19F NMR analysis. Note: The 19F NMR spectrums of the starting material (bromopentafluorobenzene) and the 2 products (2, 3, 4, 5, 6-Pentafluorostyrene and pentafluorobenzene) were analysed to find a significant peak for each chemical. The crude 19F NMR spectrum is used to compare the integral of these 3 significant peaks in order to determine the ratio of product formed. Refer to Ref. 2 for more details on the calculation of the product conversion and product ratio. In this study, SFMT is used to carry out transformations that include gaseous reagents ( Table 1), light-mediated reactions (Table 2), and reactions that involves both gaseous reagents and photo-catalysis (Table 3). Figure 1 displays a typical set-up for the gas regulator to be connected to the gas cylinder so as to regulate the pressure of the gas being pumped into the SFMT system. Figure 2 represents the set-up of how reagents are being linked for the reagents to be pumped into the SFMT system. The length of the tubing depends on the total volume used in the reaction, and they can be secured by cable tie as shown in Figure 2a or secured by rubber band and test tube in Figure 2b. Note: For more details on the connectivity of the various equipment in the flow system, please refer to this paper, Ref 8. Figure 3 illustrates the schematic scheme of how a SFMT system in 2D for better illustration. Figure 4 shows a typical set-up for degassing chemicals. A balloon is usually attached to a disposable syringe and secured with a rubber band. 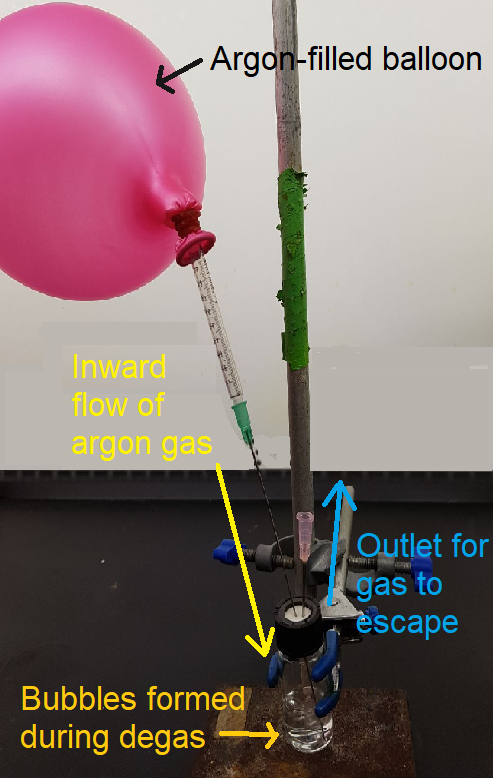 The balloon is purged with argon gas at least three times before filling up with argon gas, and it is attached to a long needle and fully submerged to the bottom, as shown below. An outlet is also inserted to allow the gas to escape, with visible bubbles during the process. Note: For more details on the degassing process, please refer to this website, Ref 9. In Figure 5, various parts of the flow system has been shown. Typically, the furrule and Nut part is the important part attached to the end of the tubing (Figure 5a). This is to allow the tubing to be attached to a syringe via a syringe connector (Figure 5b) or a needle connector (Figure 5c). In some cases, to connect two tubes together, a Union Body Peek could be used, as shown in Figure 5a. Figure 5d shows a needle valve (left), which could be used to regulate the flow rate of the gas or liquid entering the system, and a BPR (right), which aids in regulating the pressure within the system. Figure 5e shows a T-connector (left), which is used to mix two reagents (liquid or gas) together to enter the system. In the middle and on the right of Figure 5e displays the shut-off valve in its open and close position, respectively. In the open state, the reagents can enter the system while the close position prevents the chemical from entering or exiting the system. Figure 6 shows the 1:1 ratio in the plug which can be adjusted accordingly with the needle valve for the amount of gas entering the system. Maintaining an equilibrium is important to ensure that there is enough acetylene gas in the tubing for the reaction to proceed. Table 1 illustrates the optimization data for Sonogashira coupling with acetylene gas. Various conditions such as solvent, palladium catalysts and temperatures are tested with acetylene gas and 4-iodoanisole in SFMT. The optimal condition in SFMT is shown in entry 10. The reaction was repeated in a batch reactor, as shown in entry 11, however, both the conversion and selectivity were significantly lower than that in the SFMT reactors. The yield of these reactions were determined by GC analysis using 1, 3, 5-trimethoxybenzene as the internal standard. Table 2 shows the alkylation of tetramethylethylene ( 2a) and benzylidenemalonitrile ( 2b) via photo-mediated activation of an organic catalyst. The reaction was carried out in both batch and SFMT reactors during optimization, and the yield are similar. However, a shorter time is required in the SFMT reactors. The yields of these reactions were determined by 1H NMR analysis with 1, 3, 5-trimethoxybenzene as the internal standard. Table 3 demonstrates a photo-mediated gas reaction that uses acetylene as a feedstock to generate fluorinated styrene compounds. Comparison was performed in both batch and SFMT reactors, where acetylene gas was bubbled into the solvent using a balloon in the former. The product yield and selectivity were determined by 19F-NMR analysis of the crude reaction mixture. Figure 1: Gas regulator set-up with gas cylinder. A gas regulator is attached to the gas cylinder to regulate the gas pressure pump into the SFMT reactor. The high pressure gauge (green box) is adjusted by attaching a wrench to the part (black box) by turning clockwise or anti-clockwise. The low pressure gauge (blue box) is regulated by the tap valve (yellow box). The arrestor (orange) is connected to prevent any flame from entering the gas cylinder for safety purposes. Please click here to view a larger version of this figure. Figure 2: Set-up for SFMT reactor. [2a] Liquid reagents are usually pumped into the system via the syringe pump. The BPR is usually attached at the end and inserted into a glass vial filled with acetone to ensure that the pressure of the gas is sufficient in the tubing (yellow box). 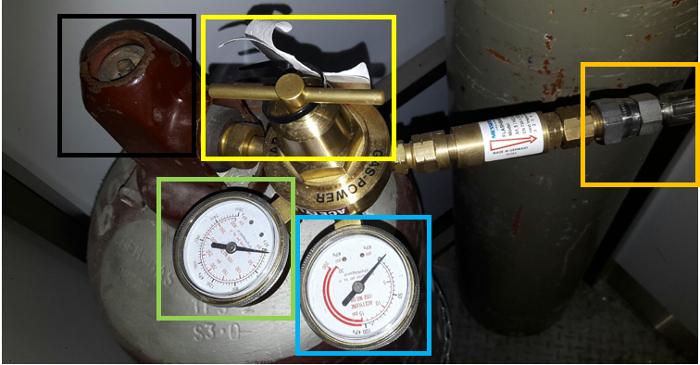 This is the plug in the set-up to observe that the liquid and gas is in 1:1 or 1:2 ratio (blue box) by regulating the needle valve connected to the gas cylinder (black box). [2b] Tubing is secured to a test tube or bottle that is connected to shut-off valve. Please click here to view a larger version of this figure. Note: The end in Figure 2a is usually attached to a gas cylinder regulated by a gas regulator. Figure 3: Schematic scheme for the connectivity of a SFMT set-up. A basic SFMT set-up usually consists of two shut-valves, reaction tubing, a BPR and a syringe pump. Adapted with permission from Ref. 2. Copyright (2017) The Royal Society of Chemistry. Please click here to view a larger version of this figure. Please click here to view a larger version of this figure. Figure 4: Degas set-up. A balloon is attached with a long needle to bubble the solvent for degassing. This long needle is inserted into the vial until the tip touches the bottom. A short needle is inserted into the headspace, and the tip does not touch the solvent. This serves as an outlet to allow gas to escape. Figure 5: Different parts needed for the SFMT system. 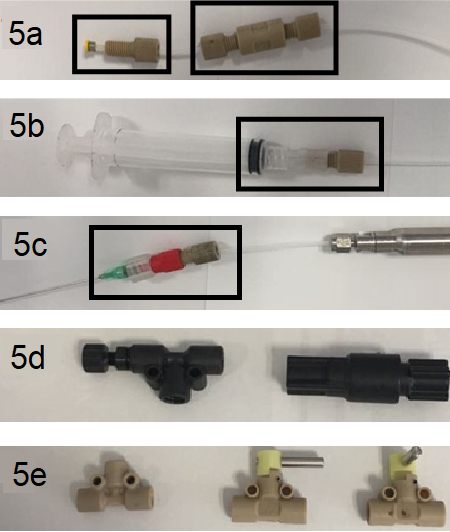 [5a] Furrule and nut part (left) and Union Body PEEK (right), [5b] syringe connector, [5c] needle connector, [5d] needle valve (left), back pressure regulator (BPR) (right), [5e] T-connector (left), shut-off valve in open position (middle) and shut-off valve in closed position (right). Figure 6: 1:1 ratio of liquid:gas in tubing plug. In the yellow box, an example is shown for how to adjust the liquid:gas ratio to 1:1 with the shut-off valve. Table 1: Optimization of 4-iodoanisole with acetylene gas. [i] Reactions were carried out with 1a at 0.1M. [ii] The yields of the reactions was determined using 1, 3, 5-trimethoxybenzene as the internal standard in GC analysis. [iii] The reaction was carried out with 1 mol% Pd(PPh3)2Cl2. [iv] The reaction was conducted for 2 hours before quenching. [v] Reaction was carried out in a batch reactor whereby the gas was introduced by bubbling acetylene gas. Adapted with permission from Ref. 2. Copyright (2017) The Royal Society of Chemistry. Table 2: Transformation of tetramethylethylene (2a) and benzylidenemalonitrile ( 2b) under photo-mediated conditions. [i] Yields were determined using 1, 3, 5-trimethoxybenzene as the internal standard in 1H NMR spectra analysis. Adapted with permission from Ref. 5. Copyright (2017) The Royal Society of Chemistry. Table 3: Utilization of acetylene gas as feedstock for photo-redox catalysis. [i] The product yield and selectivity were determined by 19F-NMR analysis of the crude reaction mixture. [ii] Reaction was carried out with 20 PSI back pressure rRegulator (BPR). Adapted with permission from Ref. 2. Copyright (2017) The Royal Society of Chemistry. The newly developed SFMT reactor is a modification of the continuous-flow system by adding shut-off valves to the micro-tubing2. In this system, the flow rate of a desired volume of reagents can be halted at will, simulating a batch reactor but in micro-tubing2,10,11. These valves aid in the trapping of desired amount of reagents in the HPFA or stainless steel tubing while maintaining the pressure within, similar to a high-pressure vessel. This convenient system is capable of screening multiple reaction conditions by setting multiple SFMTs in parallel while reducing the time needed in comparison to continuous flow system. The reactivity and selectivity of 4-iodoanisole were investigated in both batch and SFMT reactor (Table 1). Low selectivity between terminal and symmetric internal alkynes was observed in conventional batch reactors. This was likely due to poor interfacial interaction between the liquid mixture and acetylene gas. Continuous flow reactors are also inefficient for screening optimization because they require a relatively long reaction time of 2 hours. On the other hand, SFMT reactors provided a great platform for screening the proposed reactions under 10 different conditions in less than 3 hours, which in principal could take more than 20 hours in a continuous flow reactor. Therefore, SFMT is a logical choice for screening gas-involved transformations compared to batch and continuous flow reactors. In SFMT, the reactor provides higher interfacial surface area between the gaseous and liquid phase, allowing the reactions to proceed with better selectivity and reactivity than batch reactors, as shown in Entry 10 and 11 in Table 1. From Table 2, the required reaction time of visible-light promoted alkylation was greatly reduced from 18 hours to 5 hours when a SFMT reactor was utilized5. This could be explained using the Bouguer-Beer-Lambert's law, whereby the intensity of the light is reduced due to the scattering or absorption of light by the particles in the solution within the batch reactor7. On the other hand, SFMT allows an enhanced homogenous scattering of light to the reagents within the micro-tubing, which eventually shortens the time needed for the reaction. Therefore, our results emphasise that light-irradiation was greatly improved in SFMT reactors, making the platform suitable for light-mediated reaction development. The transformation in Table 3 further demonstrates the usefulness of SFMT reactors when the reaction consists of both gaseous reagents and a photo-mediated catalyst. Unlike an acetylene filled balloon, which gives poor interfacial mixing between gaseous and liquid phases, the SFMT greatly improves the solubility of acetylene gas as the internal tubing pressure was increased with the aid of BPR1,2. In the vinylation reaction, acetylene has a really poor solubility in acetonitrile at 60oC in the batch reactor, which is the optimal condition obtained in our SFMT reactors. This is probably the reason why <5% conversion was observed. This result highlights the efficiency of SFMT reactors for gas-involved light-promoted transformations, which enables conventional inaccessible transformations. Despite the low mixing efficiency in SFMT when compared to the stirring in batch reactors, the circular flow patterns in Taylor flow promoted efficient gas/liquid interfacial contact, which enhances the reactivity and yield significantly2,12. Moreover, SFMT is a time-efficient technique that allows parallel screening of reactions whereby each reactor can be set to a different pressure and/or temperature2. The flexibility in using SFMT is definitely an ideal way to test new reactions for optimization or discovery. As SFMT is a modified version of the continuous-flow reactor system, it is also easier to translate it into continuous-flow synthesis for upscale purposes. In conclusion, SFMT is a new technique that allows experiments to be carried out at varying temperatures and pressures with simple tools and micro-tubing. Cheap and reactive feedstock like acetylene gas and ethylene gas can be used for future synthesis in SFMTs, expanding the possibilities of reaction screening in the field of chemistry. Furthermore, the efficiency of reaction screening is boost with the ease of screening of reactions in parallel. We are grateful for the financial support provided by the National University of Singapore (R-143-000-645-112, R-143-000-665-114) and GSK-EDB (R-143-000-687-592). Mallia, C. J., Baxendale, I. R. The Use of Gases in Flow Synthesis. Organic Process Research & Development. 20, (2), 327-360 (2016). Xue, F., Deng, H., Xue, C., Mohamed, D. K. B., Tang, K. Y., Wu, J. 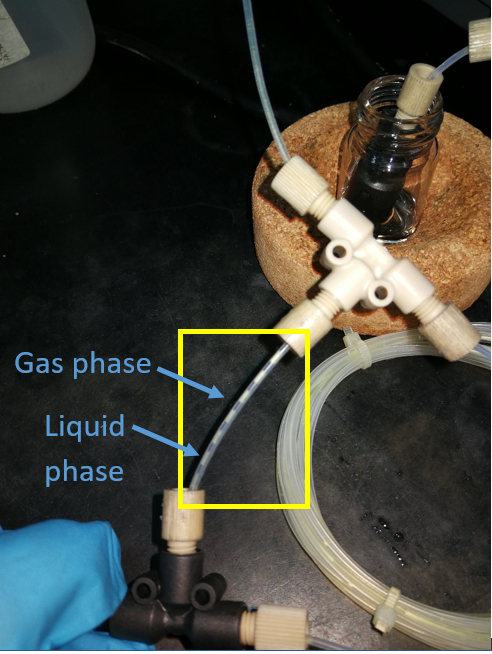 Reaction discovery using acetylene gas as the chemical feedstock accelerated by the "stop-flow" micro-tubing reactor system. Chemical Science. 8, (5), 3623-3627 (2017). McTeague, T. A., Jamison, T. F. Photoredox Activation of SF6 for Fluorination. Angewandte Chemie International Edition. 55, (48), 15072-15075 (2016). Mohamed, D. K. B., Yu, X., Li, J., Wu, J. Reaction screening in continuous flow reactors. Tetrahedron Letters. 57, (36), 3965-3977 (2016). Zhou, R., Liu, H., Tao, H., Yu, X., Wu, J. Metal-free direct alkylation of unfunctionalized allylic/benzylic sp3 C-H bonds via photoredox induced radical cation deprotonation. Chemical Science. 8, (6), 4654-4659 (2017). Prier, C. K., Rankic, D. A., MacMillan, D. W. C. Visible Light Photoredox Catalysis with Transition Metal Complexes: Applications in Organic Synthesis. Chemical Reviews. 113, (7), 5322-5363 (2013). Cambié, D., Bottecchia, C., Straathof, N. J. W., Hessel, V., Noël, T. Applications of Continuous-Flow Photochemistry in Organic Synthesis, Material Science, and Water Treatment. Chemical Reviews. 116, (17), 10276-10341 (2016). Straathof, N. J. W., Su, Y., Hessel, V., Noel, T. Accelerated gas-liquid visible light photoredox catalysis with continuous-flow photochemical microreactors. Nat. Protocols. 11, (1), 10-21 (2016). Robards, K., Haddad, P. R., Jackson, P. E. High-performance Liquid Chromatography—Instrumentation and Techniques. Principles and Practice of Modern Chromatographic Methods. 5, 227-303 (1994). Linder, V., Sia, S. K., Whitesides, G. M. Reagent-Loaded Cartridges for Valveless and Automated Fluid Delivery in Microfluidic Devices. Analytical Chemistry. 77, (1), 64-71 (2005). Terao, K., Nishiyama, Y., Tanimoto, H., Morimoto, T., Oelgemöller, M., Morimoto, T. Diastereoselective [2+2] Photocycloaddition of a Chiral Cyclohexenone with Ethylene in a Continuous Flow Microcapillary Reactor. Journal of Flow Chemistry. 2, (3), 73-76 (2012). Qian, D., Lawal, A. Numerical study on gas and liquid slugs for Taylor flow in a T-junction microchannel. Chemical Engineering Science. 61, (23), 7609-7625 (2006). Hamilton, D. S., Nicewicz, D. A. Direct Catalytic Anti-Markovnikov Hydroetherification of Alkenols. Journal of the American Chemical Society. 134, (45), 18577-18580 (2012). Singh, A., Teegardin, K., Kelly, M., Prasad, K. S., Krishnan, S., Weaver, J. D. Facile synthesis and complete characterization of homoleptic and heteroleptic cyclometalated Iridium(III) complexes for photocatalysis. Journal of Organometallic Chemistry. 776, 51-59 (2015).